How do I make salsa? One of our most requested recipes… but already made in the jar! LOL. Very necessary note: take out the seeds if you don’t like it hot. Keep some seeds if you like it medium, and so on-wear rubber gloves when doing this, or the oil in the seeds will burn your fingers, if this happens, soak them in lemon juice, it will take out the burn. 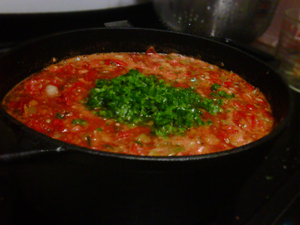 Reduce heat to medium – low, stirring often for 1 hour or until thickened. Note: After bringing to a boil in my roasting pan, I put the salsa, uncovered, in the oven at 300 – this prevents the chance of burning – for about 2 ½ to 3 hrs or until desired thickness. Add coriander and cook for another 5 minutes. Bottle in sterilized jars. EXTRA HOT? – take all the seeds you took out from the jalapeno’s and put them in a side dish & cover with the salsa just made – put in oven to reduce – why make two separate batches? When it can all be done in 1.